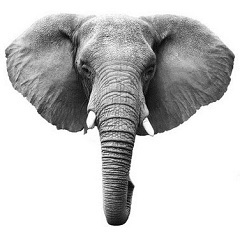 As reported in an earlier post, the third draft of proposals for changes to DSM-IV categories and criteria is delayed because DSM-5 field trials are running behind schedule. This third and final draft is now expected to be released for public review and comment, “no later than May 2012”, according to DSM-5 Task Force Vice-chair, Darrel Regier, MD . 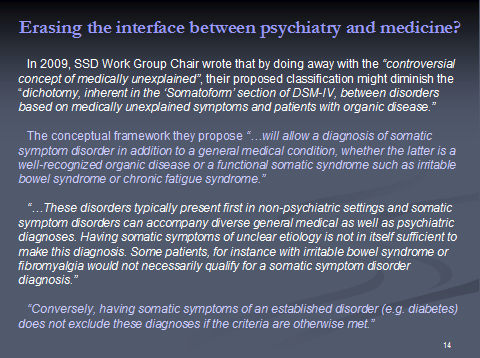 While the media has focused on the implications for introducing new disorder categories into the DSM and lowering diagnostic thresholds for existing criteria, there has been little scrutiny of the proposals of the Somatic Symptom Disorders Work Group. These radical proposals for rebranding the Somatoform Disorders categories as Somatic Symptom Disorders and combining a number of existing, little-used categories (somatization disorder, hypochondriasis, pain disorder, and undifferentiated somatoform disorder) under a proposed portmanteau term, Complex Somatic Symptom Disorder (CSSD), and the more recently proposed, Simple Somatic Symptom Disorder (SSSD), which requires symptom duration of as little as one month, have the potential for bringing many thousands more patients under a mental health banner. Under the guise of “eliminating stigma” and eradicating “terminology [that] enforces a dualism between psychiatric and medical conditions” by “de-emphasizing the concept of ‘medically unexplained'”, the American Psychiatric Association appears hell bent on colonising the entire medical field by licensing the potential application of a mental health diagnosis to all medical diseases and disorders.